Have you ever wanted something so badly that you sabotage yourself each time you attempt to begin? Well — that has been my struggle with telling a story that is close to my heart, about a place that spoke to me but was always at a remove. And now that place could be lost forever. Sometimes our dreams seem like just piles of bricks, things that have lost their usefulness and potential because of inactivity or impracticality. I’ve always been someone who had her head in the clouds and her feet on the ground, and struggled between reconciling the two. I struggle with knowing when to give up and find a new dream. That’s because I believe what we dream is real. What we imagine is real. If two people or ten or a thousand believe in the same dream, then a pile of bricks can become a fortress. Or a castle. Or a paradise. That’s not to say making it a reality won’t be hard. It’s going to be a challenge. But shouldn’t we build anyway? Shouldn’t we restore what can be saved, and hold on to it? Cherish it? We can’t be discouraged by people who let their own dreams die. Or by those who gave up because the risks seemed insurmountable. We can’t let our hopes fall to ruin. We can’t let our dreams become rubble. This shoot reminded me to get out of my own way, to improvise and have fun, to rennet why I started and to press forward in spite of my fear. In spite of the little voice that always second guesses me. New year, new COLOR of the year from Pantone! This year’s signature shade is “marsala,” a rich burgundy wine that you’ll see in clothing, accessories, makeup and home décor throughout 2015. You can wear it in small doses via your nail or lip color (my go-to’s are Essie’s “Wicked” nail polish and Guerlain’s luscious Rouge G de Guerlain L’Extrait in Orgueil) or add it to your wardrobe. I love this ensemble from H&M because has all the right elements: layers, a modest hint of skin and a monochromatic top-to-bottom palette that wins kudos for being slimming! Come on…you had to see this coming! I’m in love with J. Crew Factory’s puffer vests (see HERE and HERE), and they look so cute with denim, leather and even skirts. Plus they have pockets, which are great when you have to streamline your purse to meet stadium restrictions on large handbags. (Our local J. Crew Factory store is located at the Outlet Shops of Grand River in Leeds.) A crimson lip can be your finishing touch. I’d stay away from layering an infinity scarf over this, or wearing it over a denim jacket – the point is not to look like Marty McFly. Instead, I’d choose a chambray shirt and statement necklace. Add flat boots, a light crossbody bag like this one from Coach and your favorite gameday button and you’re done! To get more mileage out of it, try pairing it with a dressier pant, patterned sweater and heels (as J. Crew Factory styles it below). You could also try layering an oversized cardigan, a fur vest* or even belting a long scarf over your outfit to achieve a similar effect (InStyle shows you how HERE). An added benefit as you enjoy tailgating or dress for seasonal occasions: these options all camouflage food babies! 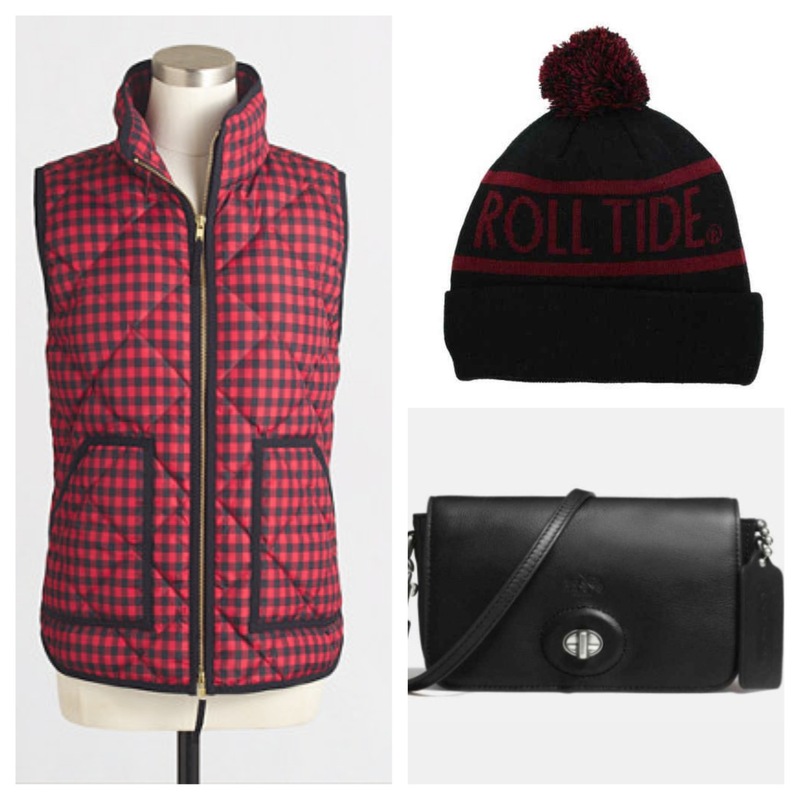 Roll Tide and happy shopping! *Beware the faux fur ones appearing either totally lackluster/dry or super shiny; it’s a dead giveaway that they’re fake.